WGSN has launched WGSN Insider, a new digital platform offering an insight into the lives of the global trend forecaster’s editors and other “insiders” from the fashion, interiors, design and creative worlds. The new free-to-view site features daily news as well as articles from WGSN editors and industry insiders in sectors such as catwalks, denim, youth, beauty, lifestyle & interiors, marketing and technology. Readers can sign up for a free daily news bulletin showcasing the latest content. WGSN Insider is edited by WGSN senior editor, special projects, Sara McCorquodale and WGSN global chief content officer Carla Buzasi will be making regular contributions, including a weekly round-up. 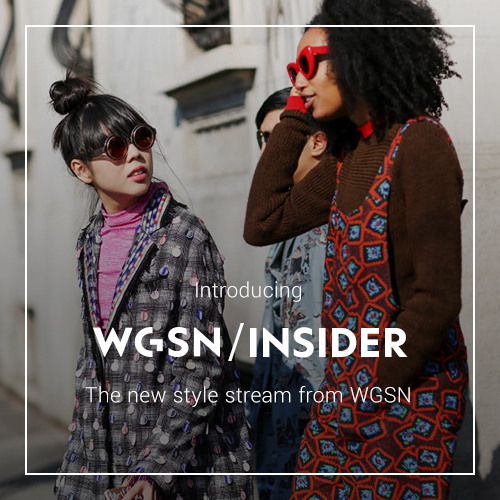 “WGSN Insider reveals the WGSN world, which means – for the first time – we’re giving everyone access to the ideas, opinions, imagery and video of our incredible team. As we have editors, photographers and trend forecasters all over the world, our breadth of coverage is unrivalled. One day readers will be able to enjoy street style from Havana, the next they can read comment by the sharpest minds in fashion,” said Sara McCorquodale. “WGSN Insider is also a platform for the industry to discuss issues and share ideas, advice and experiences. We are such an integral part of fashion, it was a natural step for us to create this space,” she added. WGSN’s main subscriber site publishes more than 350 reports a month featuring indepth analysis, insight and data on the industry, while WGSN Insider offers a “sneak peek” into that process, said global chief content officer Carla Buzasi. “Our Editors travel the world meeting designers, artists, architects, retailers, entrepreneurs, photographers and more, and with WGSN Insider, we’ll be sharing a little bit of those journeys and the characters we meet along the way,” she said. All the content from WGSN’s previous blog has been migrated into the WGSN Insider site giving an archive of thousands of articles.